The town of Bakkala was certainly one of the most famous in northwestern South Dakkastan. The dates, olives, and pistachios of the region were prized for their delicate flavour. The ivory-coloured wool of its goats was highly regarded for it softness and reputed ability to repel the undead. It was the site of the Clay Mosque of Abu Daoud, renowned for its smooth strangely curving lines, bright blue dome, and gilded minarets. Bakkala had, by virtue of its location, also been known throughout history as the “gateway to Derka-Derka”—for the town sat astride the famous Silk Road (now renamed “Highway 20”) that led eastwards through the arid scrub and hills to the South Dakkastani capital. Shortly after the Kirkland incident, Bakkala would become the site of the first major battle of the war (variously known as “Operation Hegemonic Moral Self-Assuredness” in the Federated States of Natonia, and as the “Great Patriotic War and Jihad Against the Imperialist Infidel Aggressors and their Lackeys” in the Republic of South Dakkastan). 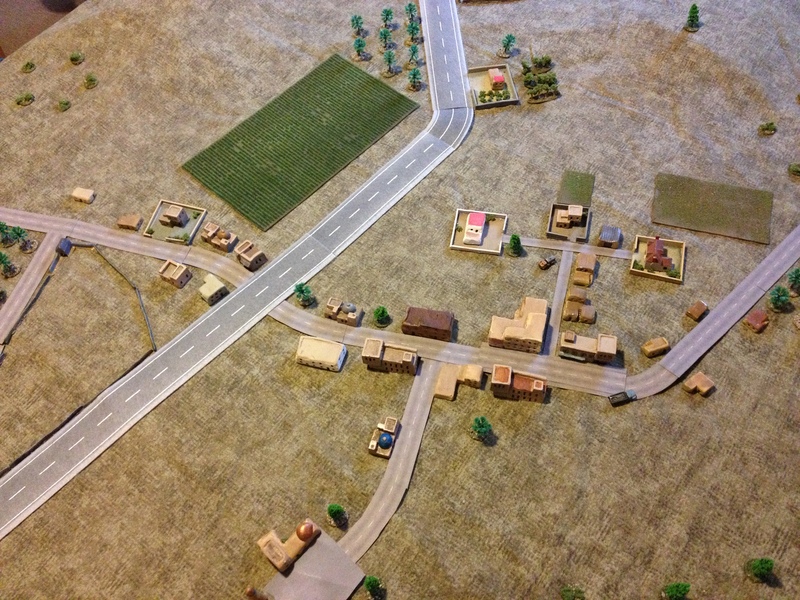 As Natonian task force commander, COL Stormfroth was reluctant to advance too quickly into the built-up area of the town, knowing that if he did so he would soon find himself in close-quarters street-to-street fighting with a much more numerous foe. Instead, he decided to build his tactics around the superiority of his formidable M1A2 Abrams tanks. Their thick armour would be all but impervious to frontal hits from the enemy armour, while its heavy gun and superior fire control system would allow it to inflict heavy damage from great distance. The TOW and Javelin ATGMs of the mechanized infantry and WALRUSes could also be expected to inflict grievous damage at a distance upon the less well equipped Dakkistanis. One platoon of M1A2s was ordered to take up positions atop Hill 101, from where they could dominate much of the battlefield. They would be accompanied by the Fire Support Team, which could call down artillery fire on targets of opportunity,or to soften-up areas prior to counter-attack. 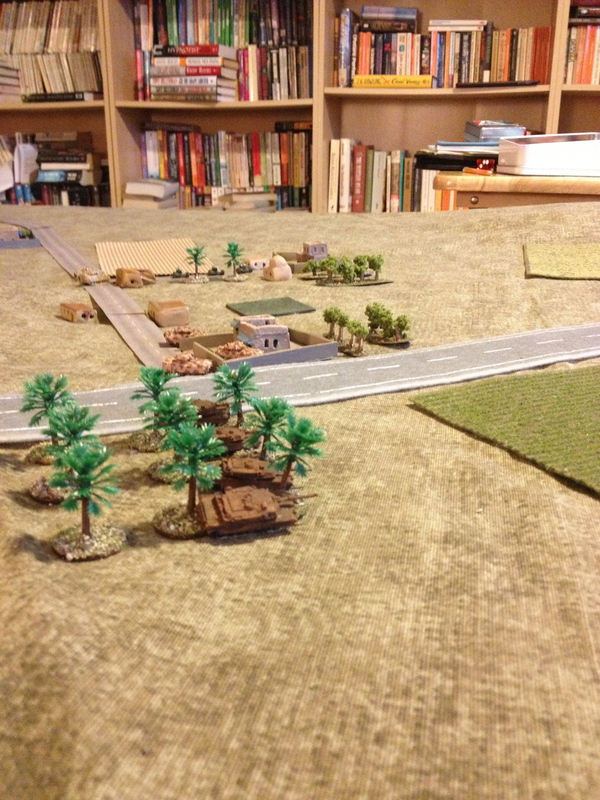 The second M1A2 platoon was to advance and take up position in a small palm grove ahead on the right of the highway. 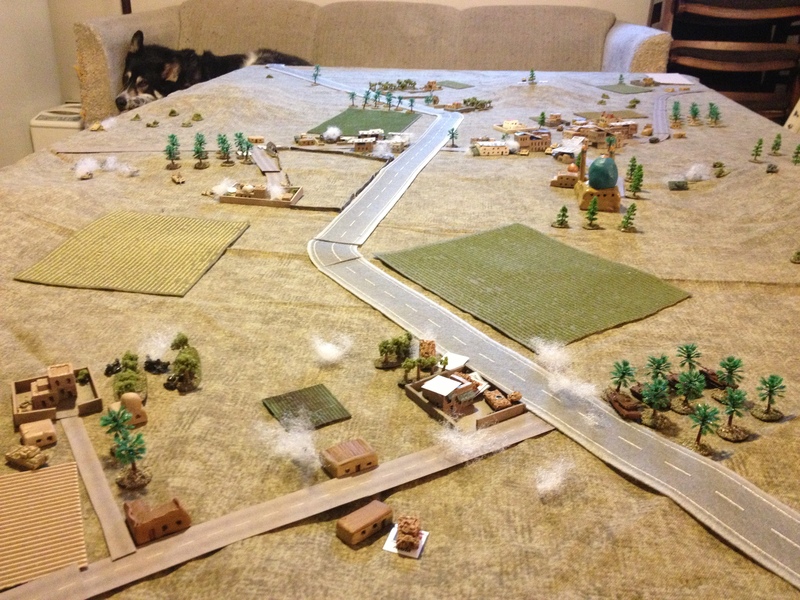 A mechanized infantry platoon would secure the walled farm to the left. 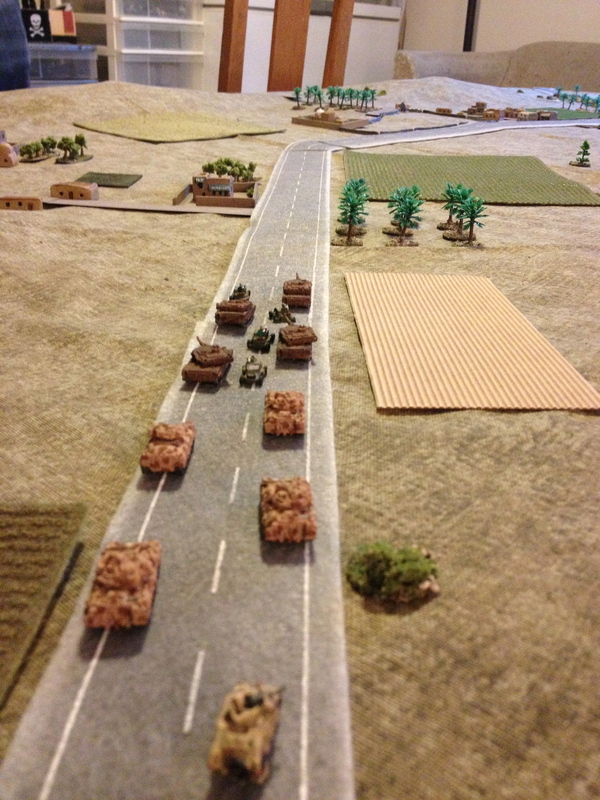 Together they formed the primary blocking position against any Dakkastani attempt advance westwards along Highway 20. They could also be assigned to support any counterattack towards the town, once the Dakkastani main force had suffered sufficient attrition. 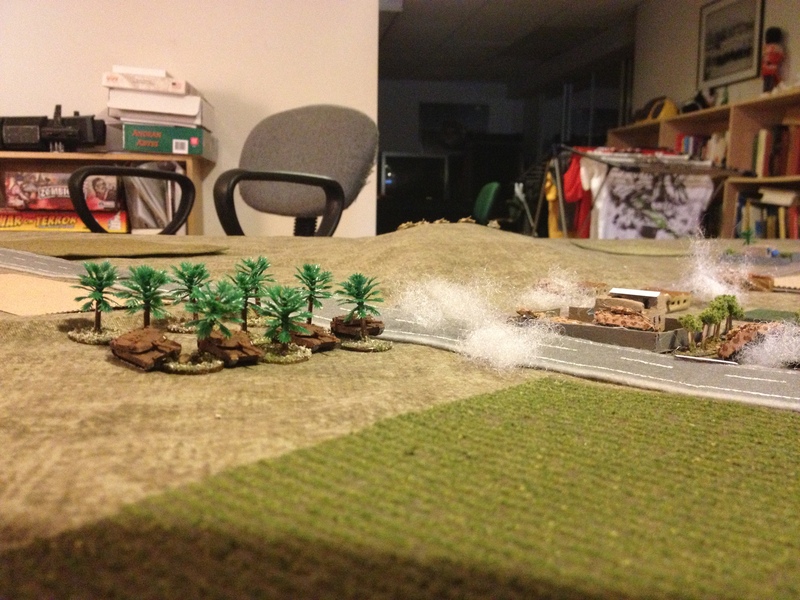 The second mechanized infantry platoon would dismount its infantry at the scrub-covered western slopes of Hill 103. From here they could maneuver to deny use of the hill to the enemy, or launch an assault against the mosque compound should orders be received to mount a counter-attack. 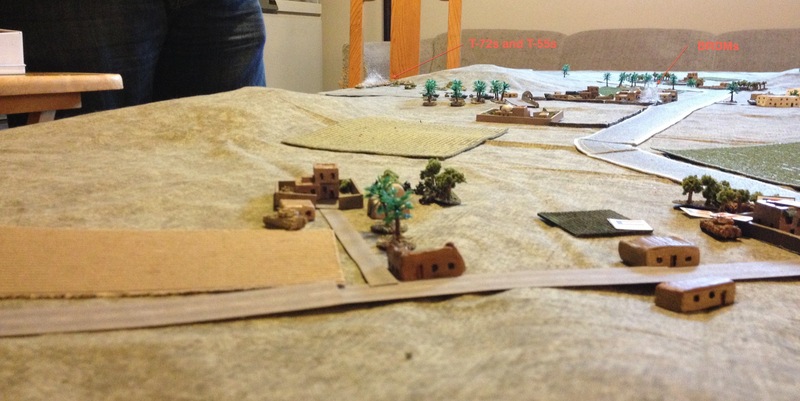 Meanwhile, the platoon’s Bradleys would retire to a nearby copse of sparse woods to provide overwatch for the infantry as well as being positioned to offer enfilading fire across the front of the rest of the task force. 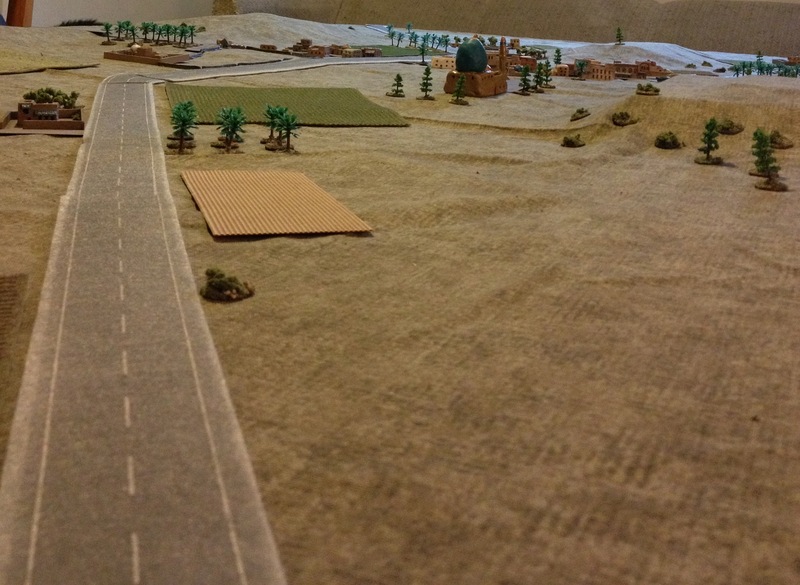 The WALRUS detachment would secure a second farm to the north of the first, where they would be joined by the headquarters and COL Stormfroth himself. The Colonel was a man who liked to lead from the front. COL Stormfroth hoped that the enemy would believe his position to be weak, and be tempted to mount a hasty assault upon it. Breaking from cover into the largely open ground that extended for up to 1,000m or more in front of the Natonian positions, the Dakkastanis would soon find themselves under withering fire from the tanks and ATGMs. 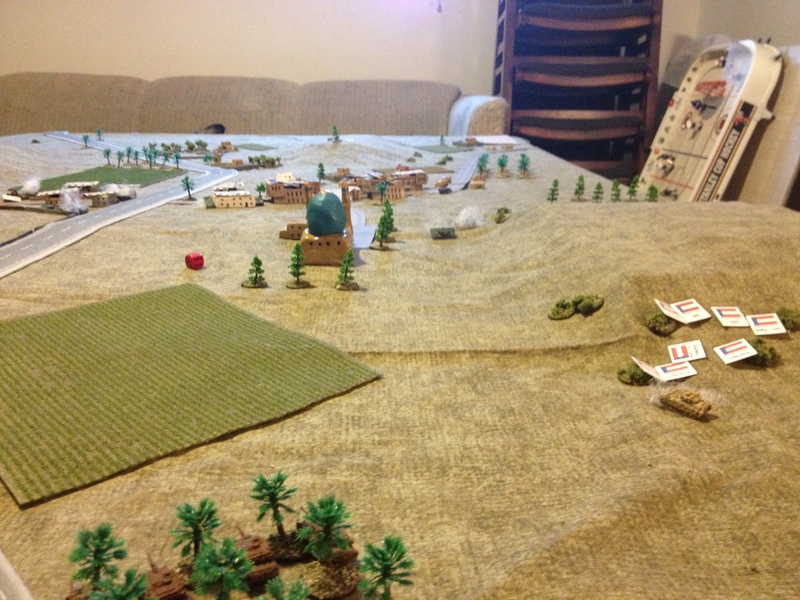 Once the enemy had been mauled in this way, the Task Force would counterattack with the forces on its right, seizing Hill 103 and the Mosque of Abu Daoud. Holding these, the mechanized infantry and supporting tanks would then leapfrog their way from successive fire positions into the town itself. 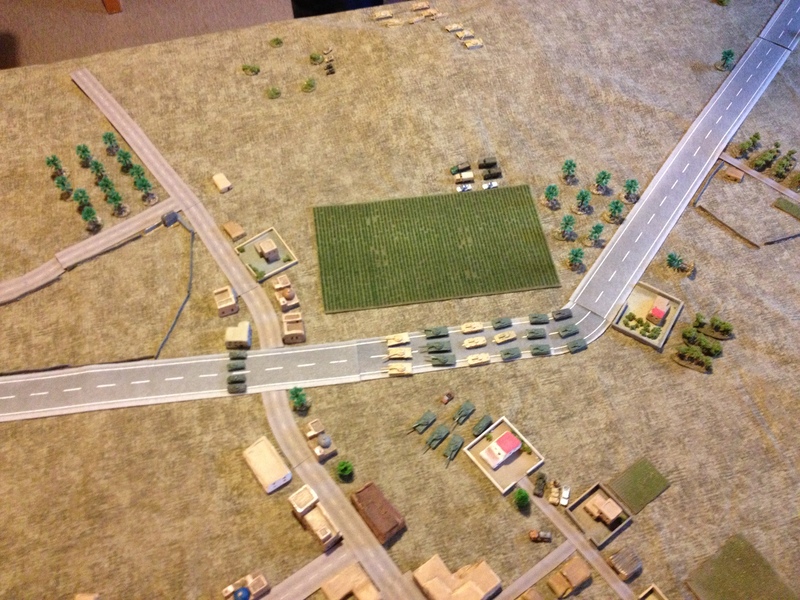 When zero hour came, Task Force Righteous Indignation sped down the highway and then turned off to take up their assigned positions. 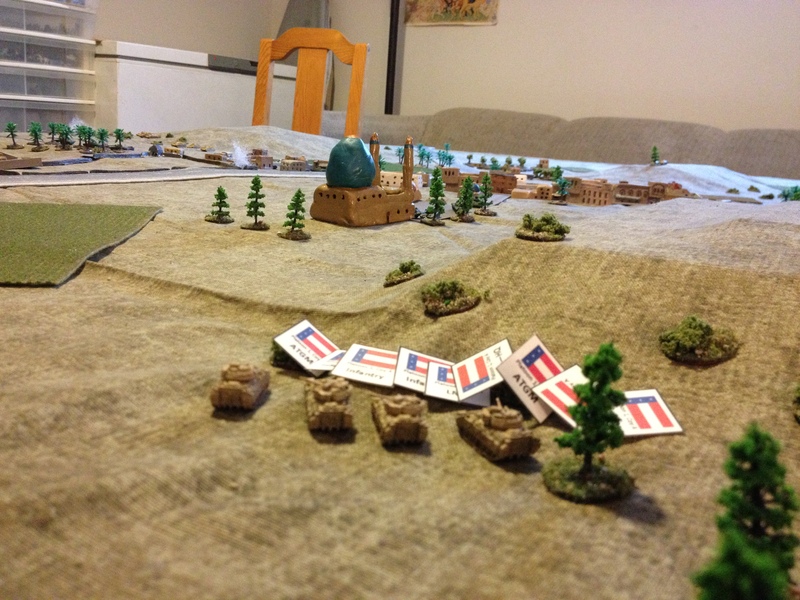 The first M1A2 platoon assumed its overwatch position on top of Hill 101. 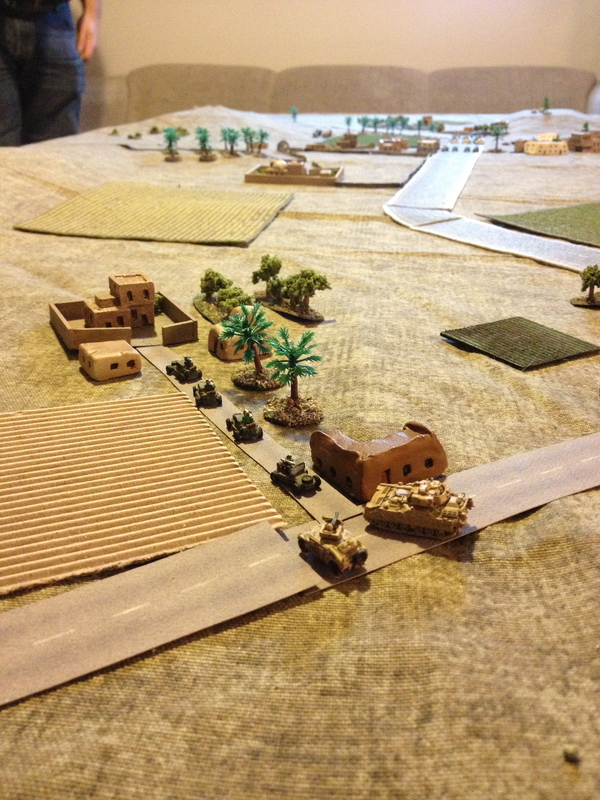 The second M1A2 platoon eased into position in the palm grove, while across the road a mechanized infantry platoon secured the farm compound. 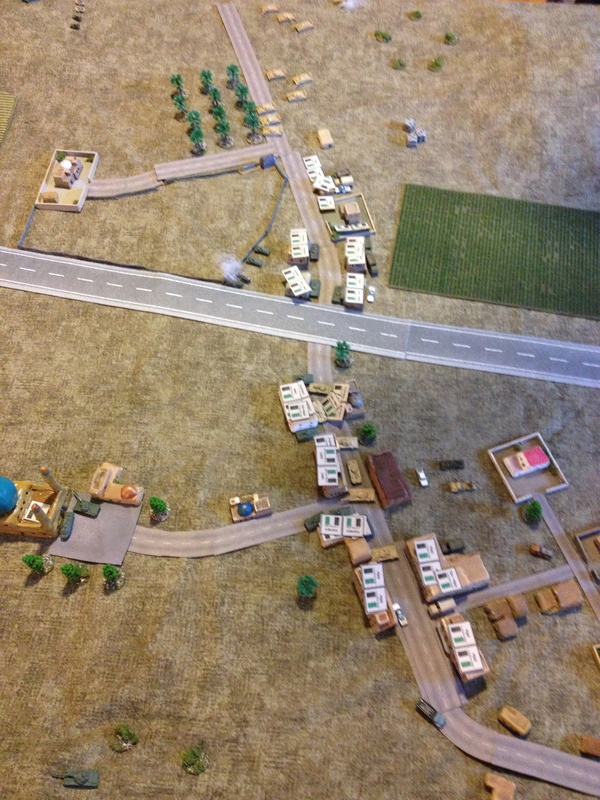 The headquarters unit and the WALRUS detachment raced to secure the next farm compound. One of the FAV drivers—clearly a special forces daredevil—appeared to be driving backwards. Overhead, a UAV spotted a sizeable enemy force heading towards Bakkala in an almost parade-ground formation. 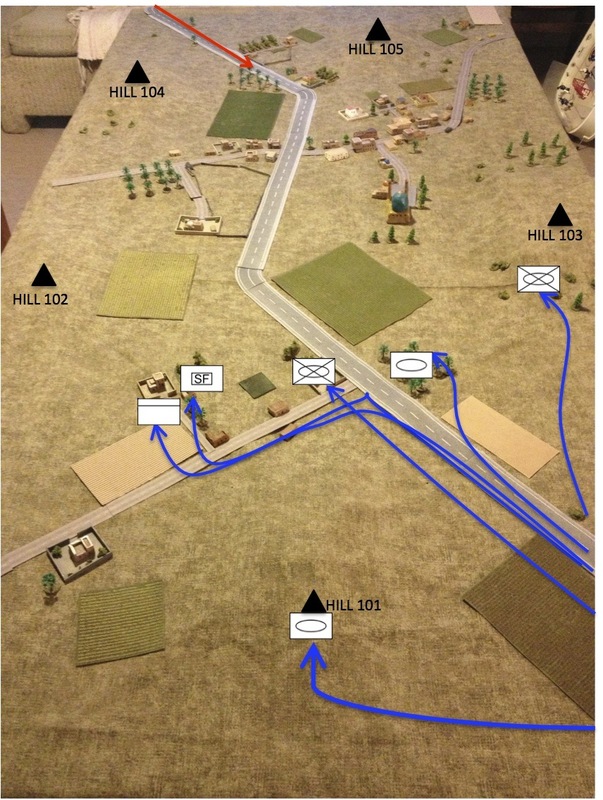 A platoon of BRDMs screened their advance. 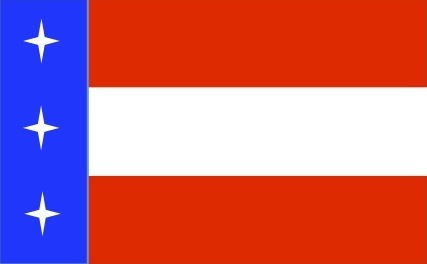 Natonian forces opened fire. Smoke could be seen about 1,800m in the distance as several T-72s and BRDMs were destroyed by Abrams and TOW fire. With the true size of the enemy force now apparent, COL Stormfroth put in a call for air support from the AH-64D Apache assigned to support his task force. On the right, the second mechanized infantry platoon dismounted and took up positions on the scrub-covered western slopes of Hill 103, overlooking the mosque. 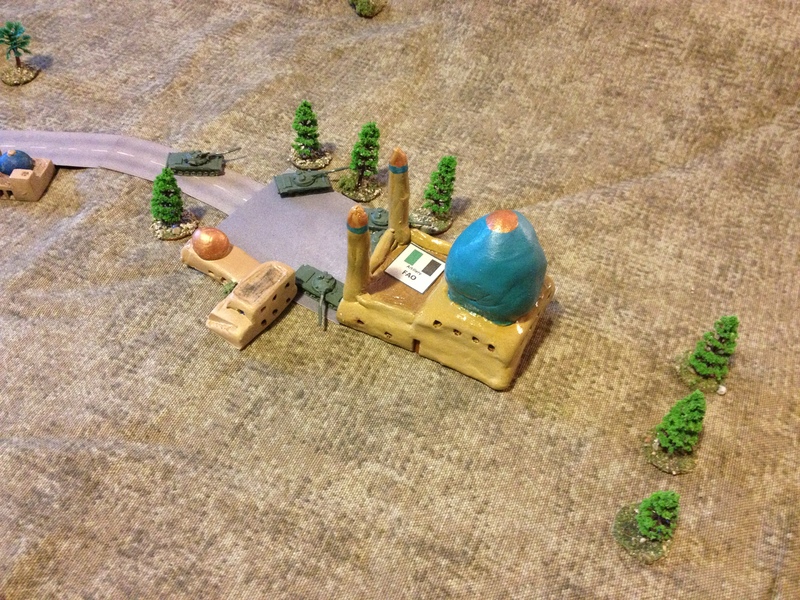 They failed to notice, however, that the enemy had already moved forces up to the mosque. Indeed, had they known that the Dakkistani forward observer had taken up a position on the roof of the ornate building, any protected status it might have enjoyed under the laws of war would have been null and void. Instead, the first indication came when one of the T-72s there maneuvered among the ornamental trees, and successfully knocked out a Bradley. A Javelin team and the Abrams on Hill 101 exacted revenge, destroying two T-72s as they tried to dash towards eastern slopes of Hill 103. UAV imagery showed that, by now, Bakkala had been heavily garrisoned by RRG infantry and Popular Militia. COL Stormfroth was glad he had not attempted a rash frontal assault. Dakkastani truck-mounted anti-aircraft guns also stood ready in case Natonian aircraft were called into action. So far, however, the Apache promised to Task Force Righteous Indignation had failed to materialize. While the enemy probe on the southern flank of the Natonian positions had stalled, the Dakkistani military sought to outflank to the north. A platoon of ARSD T-55s pulled into a walled compound to the centre of the battlefield to provide covering fire while a second platoon of T-55s, a lone T-72, and the anti-tank platoon of Popular Militia all manoeuvred around the slopes of Hill 102, trying to use it to screen them from the Natonian armour until they could close the range. Once again, the Natonian task force made urgent calls for helicopter support. Once again, there was no answer. 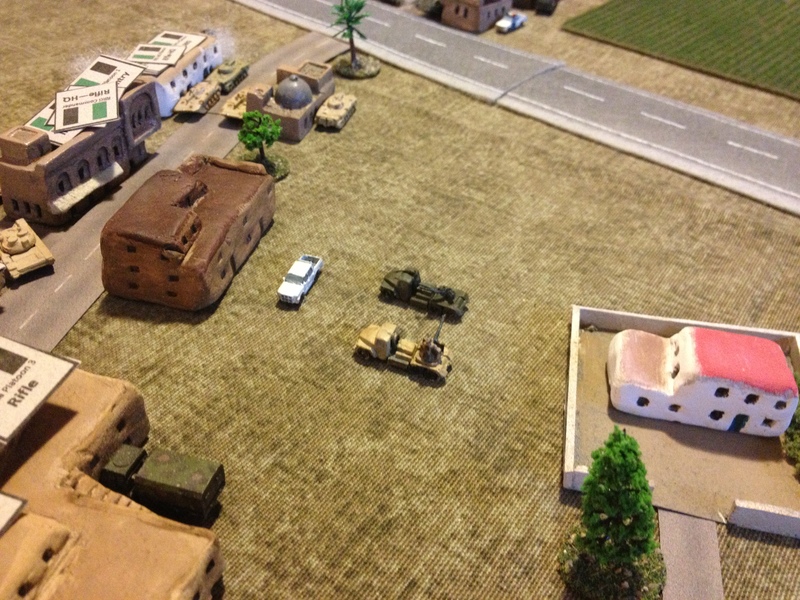 The T-55s in the compound didn’t last long as they came under fire from both the Abrams and the ATGMs of the mechanized infantry. Two of the three enemy vehicles were quickly destroyed. Natonian forces also continued to snipe at enemy vehicles on the outskirts of Bakkala when they could be spotted. 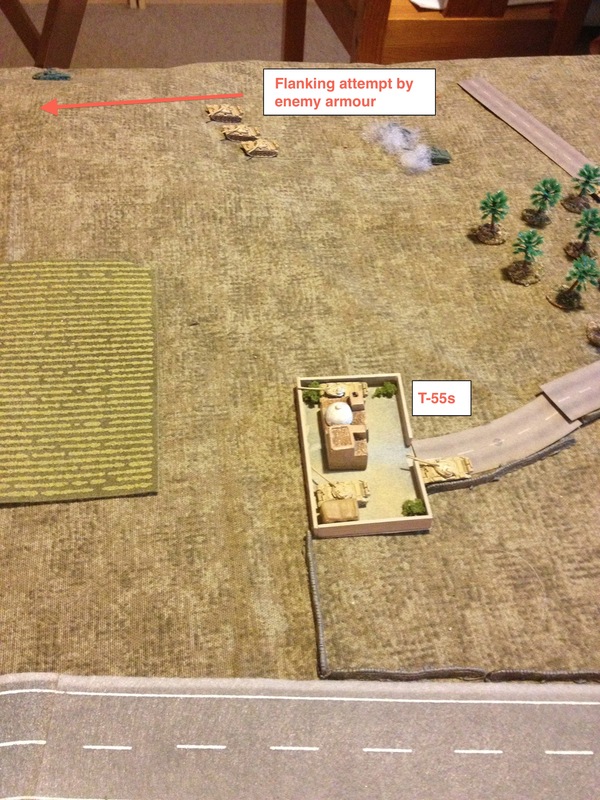 Some supporting fire from a battery of 155mm artillery was added to the mix too, the shells landing amongst a platoon of Popular Militia, and setting a farmhouse on fire. That would be one less supplier of radical pistachios to compete with the patriotic (if heavily-subsidized) farmers of the Natonian Free Trade Area. 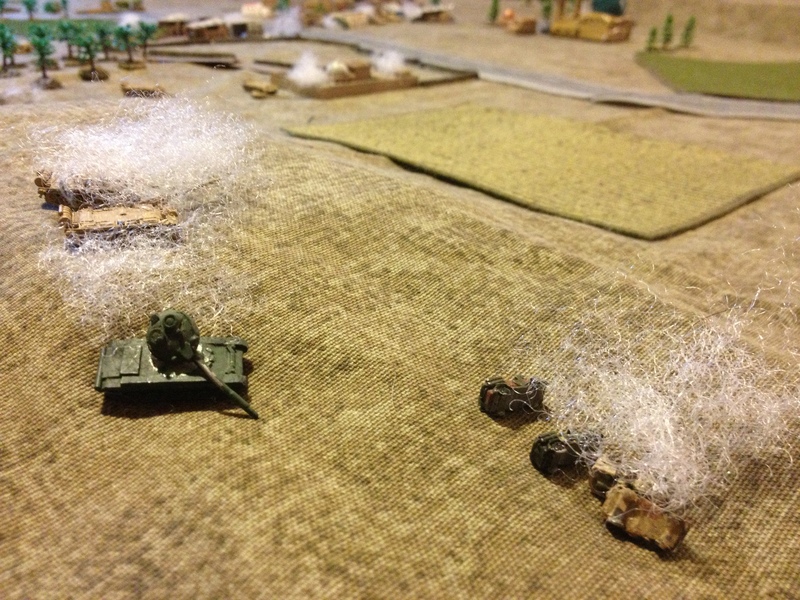 Suddenly, a massive artillery barrage—involving no less than a full battalion of eighteen 122mm howitzers—hit the Natonian first mechanized platoon. A dozen men were killed, and three of the four Bradleys were immobilized or destroyed. The survivors pulled back to a safer position. Enemy mortars atop Hill 105 also joined the shelling of the Natonian-held farm. At around the same time, the enemy’s flanking force of tanks and technicals behind Hill 102 crested the ridge to attack the Natonian forces below. 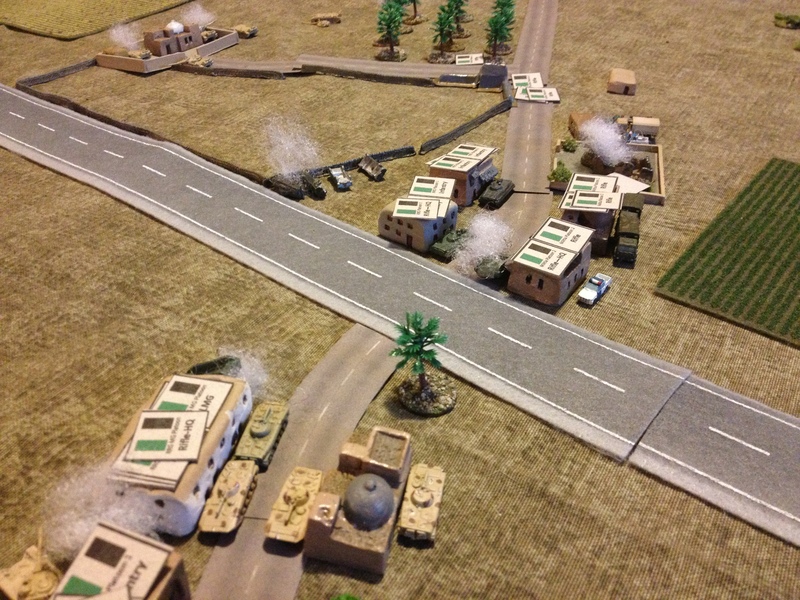 The FAV platoon was destroyed by enemy tank fire, supplemented with additional fire from the surviving BRDMs of the ARSD reconnaissance platoon. The heroism and tragic loss of the WALRUSes—truly the stuff of Nollywood movies—would not go unrecognized. 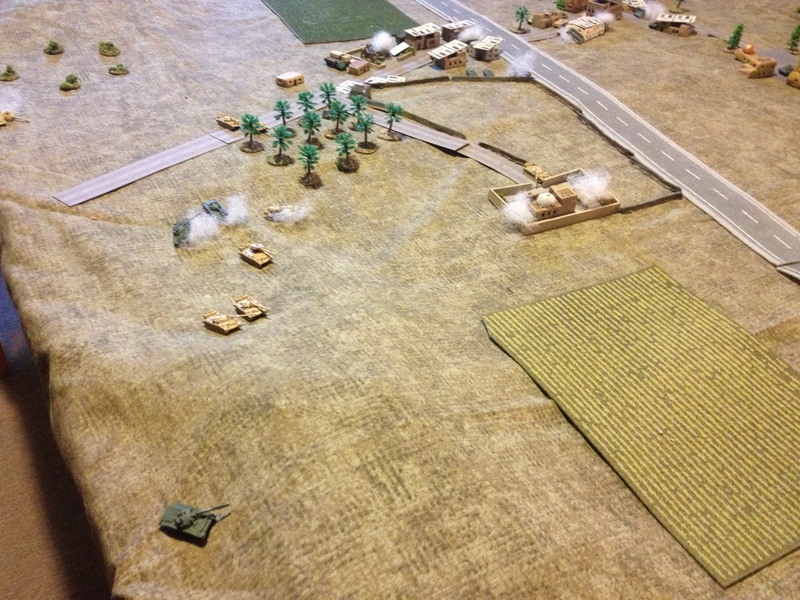 One enemy tank even managed to get a flank shot against an Abrams, but missed. “Where is my #$%^^ goddamned helicopter?” cursed COL Stormfroth as he angrily chomped on a cigar. “Well that’s too goddamned late, isn’t it?” spat the Colonel as he climbed into the 0.50 cal turret of his HMMWV and opened fire on the approaching enemy. 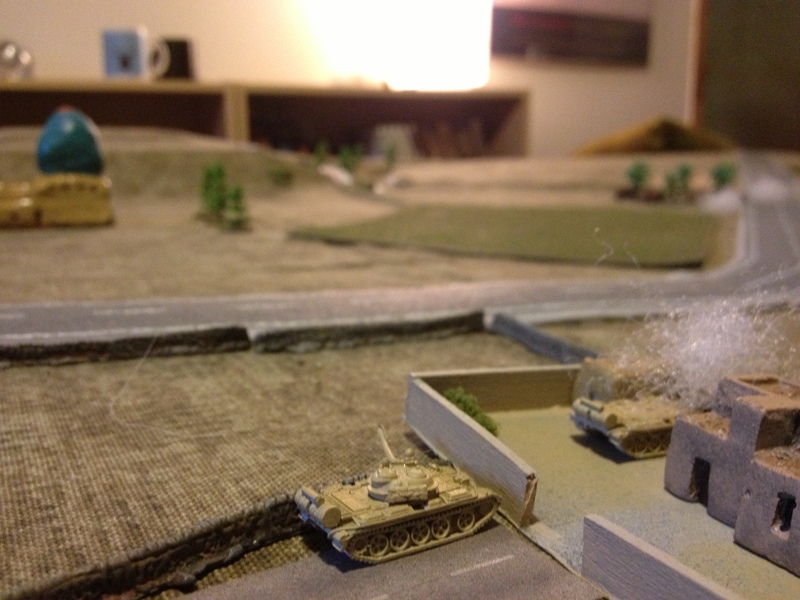 The clatter of his heavy machine gun was soon joined by the staccato bark of the 25mm autocannon on the Bradley. 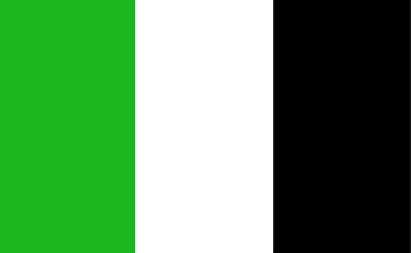 Their combined fire tore through the shabby locally-manufactured trucks of the Dakkastani militia platoon, destroying it. That would teach them to buy Natonian next time! 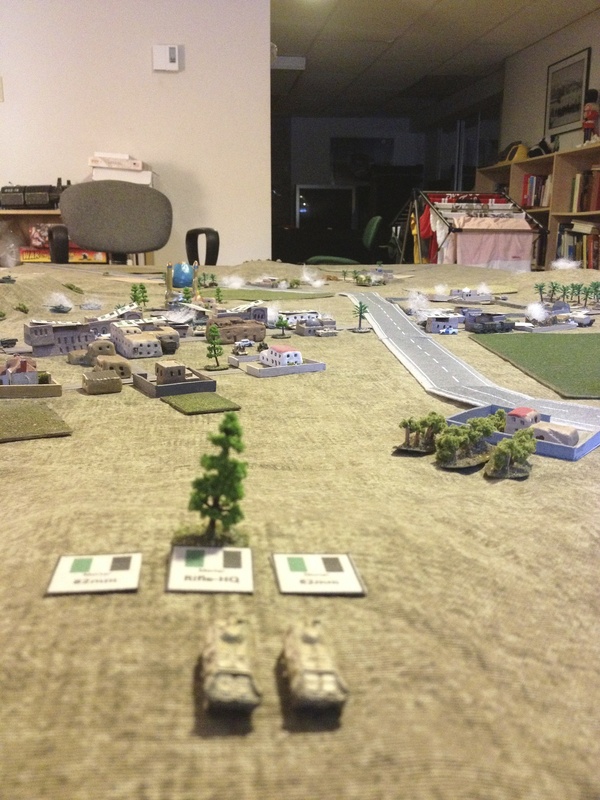 Moments later, the M1A2s atop Hill 101 opened fire. Soon the enemy T-72 and T-55s atop the ridge were also smoking wrecks. 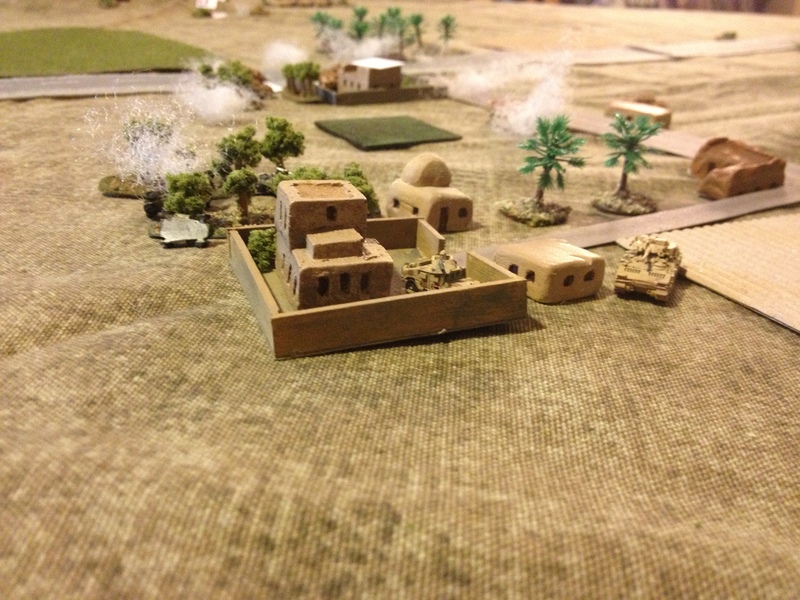 While the flanking attack had been destroyed, the town of Bakkala remained well-defended by Dakkastani infantry and BMPs. 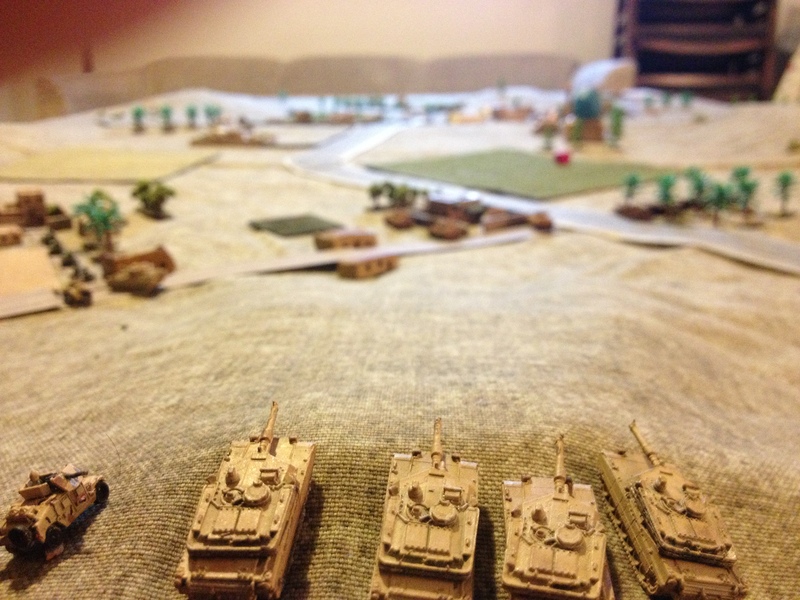 COL Stormfroth’s original battle plan had called for his mechanized infantry and a platoon of tanks to develop a counter-attack at this point. However, given the strength of the enemy force—and with the WALRUSes decimated and one of his mechanized infantry platoons shattered by enemy shelling—it would be too risky to mount an assault, even allowing for the imminent arrival of his much-delayed air support. The first battle of the war would thus end in a stalemate. Matt Caffrey’s long-awaited book On Wargaming: How Wargames Have Shaped History and How They May Shape the Future is now available from the US Naval War College Press. What’s more, it’s available as a free download. If you want a hard copy, that can be purchased from the US Government Bookstore.